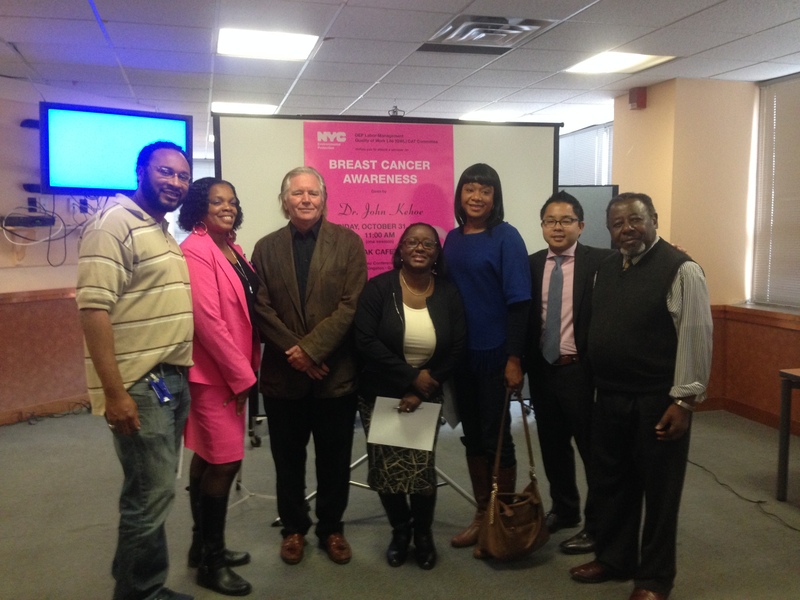 On October 31st, 2014, Dr. Kehoe was the keynote speaker at the NYC Department of Environmental Protection’s Breast Cancer Awareness Seminar. The Department of Environmental Protection hosted two seminars for its employees in order to educate women and men in being proactive with breast health. Dr. Kehoe was invited by a former patient to preside over the event and offer his expertise. During the seminar, Dr. Kehoe discussed the importance of comprehensive breast care. To those in the audience personally affected by breast cancer, Dr. Kehoe added a message of hope, affirming that survival statistics are improving daily as treatments evolve. During the Q&A portion, Dr. Kehoe answered questions regarding current treatment options, genetic testing for breast cancer, how to discuss breast health with your doctor and the importance of scheduling screening tests.